Even though Curtis isn’t in the pros anymore, he still keeps making news and as always is one of the more frequently mentioned Panthers around these parts. He was interviewed on The Best Damn Sports Show (click here for the clip on MSN), and of course the topic moved to his former employers and their video taping habits. Martin said he feels for the Patriots organization, feels they didn’t need to do this but never says he doesn’t believe it was happening or anything like that. He does however say this is the first time he’s heard of anything like this, which none of the hosts seem to believe. Other subjects were his potential to be in the Hall of Fame in 2011, and he says he thinks he has a great shot. If he’s not a first ballot inductee I don’t know who is. There’s also a picture of Martin from his high school days and a mention of playing at Pitt. Check out the video link above. In another interview, this one with Sports Business Journal, Martin talks about the behaviors of big money pro athletes. I got this story via Money Players, so check out their summary for a couple of the q&a’s, but you need to be a subscriber to SBJ to read the whole thing. One more Martin note…when freshman LeSean McCoy went over 100 yards rushing against MSU on Saturday he was the first Panther freshman to have consecutive 100 yard days since Mr. Martin in 1991. Ruben Brown was a wide-eyed Buffalo Bills rookie in 1995 when he heard the sounds of retching in the locker room bathroom before a game. Brown figured one or two of his teammates were battling a case of nerves, or perhaps a tainted helping from the pregame buffet. It turned out Bills quarterback Jim Kelly and offensive lineman Glenn Parker were forcing themselves to throw up. “If they didn’t puke before a game, they didn’t feel right about going out there,” Brown said. That is pretty sick. Who knew NFL players have eating disorders. Antonio Bryant had his suspension lifted by NFL Commissioner Roger Goodell on Monday. He is now eligible to join any team without missing any additional games. The teams I’ve seen mentioned as possibilities have included Dallas, Jacksonville, Washington, San Diego and Cleveland. He will almost definitely be signing with someone soon, and we’ll update when we hear anything. Oh and I’m getting to the NFL roundup for Week 2, just been a busy day. I have to admit I have no idea what a “Truck Stick” is…but Cracked Femur has it’s top 5 offensive hits ever dealt in college football. Palko running over that BC Safety in the YouTube video below is number 2. Check out the whole list because Iron Head Heyward makes the list as well. I know this has nothing to do with Palko being in the pros, but any excuse to watch this video again seems good enough for me. Extra credit for someone who can explain to me what a Truck Stick is and how it’s relevant to the list they put up. Just a few small items to wrap up, none really needing their own post. Chicago Bear Ruben Brown has not practiced this week because of a shoulder injury and is listed as questionable for week 2. Shawntae Spencer did not practice Wednesday with an elbow injury, but is listed as probably for Sunday. Tyler Palko was signed back to the Saints practice squad after being released from their 53 man roster on Tuesday. The Palm Beach Post has a piece on HB Blades this morning, because the Dolphins play Washington tomorrow in their season opener. Blades is a South Florida native, coming out of Plantation High. “It’s funny. His dad is taller and faster, but you could see his dad’s instincts in him,” Wannstedt said. 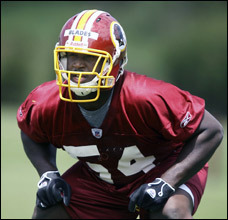 H.B., who will make his off-season home in Washington, said he doesn’t speak to his father often. “I tell people all the time he’s learned from all the mistakes we’ve made over the years,” said Bennie Blades, now a dean of students at the Academy of Coral Springs, a private school for at-risk children. Though H.B.’s relationship with Bennie and Brian was strained, he had a strong bond with uncle Al Blades, his mentor who was seven years older. Al Blades sat next to H.B. in 2003 when he signed a letter of intent to play at Pitt. HB will be playing special teams tomorrow for Washington and will be the backup at all three linebacker positions. Playing behind London Fletcher, you can’t expect to see him much but he’s lucky to be learning under a very good middle linebacker. In a couple of seasons it’s easy to think that HB will be starting somewhere on that Washington defense. Let’s start with an apology. Sorry to Tyler Palko for missing his big move on Thursday. I was writing this article on who was still on NFL teams while he was being moved up to the 53 man roster of the Saints. I listed him as on the Practice Squad, but he was on his way up to the 3rd QB spot that night against the Colts. So Congrats to Tyler, even if it’s a little late. As for the rumor, there seems to be a lot of talk going around that the Cowboys are looking for another wide receiver especially with Terry Glenn still hobbling around. One of the main names that seems to keep coming up in these discussions is former Cowboy Antonio Bryant. One thing that could hurt Bryant though is that he’d have to serve a two game suspension that is still pending when he gets back. Fullback Lousaka Polite,whom the Bears signed to the 53-man roster this week, has blended in without much fanfare—not that he was expecting any. “It’s a relief, considering I just got released [by Dallas] a couple of days before,” Polite said. Polite isn’t totally unfamiliar with the Bears. He has had numerous phone conversations with starting fullback Jason McKie because both have the same marketing agent.